Yesterday I received the following email comment from Katherine Tyrrell of Making a Mark - one of my very favorite art blogs. 1. I met my husband in our final year of high school and this year is our 40th anniversary. We married after our second year of medical school, but I remained in Philadelphia and he stayed in Chicago and we had a long-distance marriage for 2 years. He still thinks of me as "the captain of the high school cheerleaders" or calls me the "dancing hematologist." If it weren’t for his encouragement and support, I may never have gone to medical school. 2. We had 3 children between September 1971 and July 1975. I was permitted 2 weeks vacation after my first and second children were born, and then moved from California to Texas when my 3rd child was 14 days old. I have always loved being a mother (and now a grandmother) and a physician. 3. I just reduced my work schedule to 3 days/week, but continue to work as a Professor of Medicine at a New York medical school. This allows me to expand my interests and passions further - and I started sketching, painting, and joined Everyday Matters in 2005. 4. I spent 3 years intensively studying my family history (2000-3) and have 10 leather-bound, 3- ring notebooks full of birth/marriage/death records, passenger lists, and naturalization papers. My great-great-great-great grandmother was kidnapped as a child by the Delaware Indians in 1757 during the French-Indian War and released in 1764 by a treaty between the British and the Indian tribes in Ohio, USA. I read the original letter sent by Colonel Bouquet to General Gage about the prisoner release this past year at the British Library in London. 5. I don’t like or exercise, organized sports, running, jogging, hiking, or camping. I took dance classes "on and off" throughout my entire life, most recently ballet classes in New York. I have never been to a spa and have no desire to do so. I love living in a city where I can walk anywhere I want to go, but still drive to work. 6. I love textiles and everything related to them - sewing, smocking, French hand sewing, silk ribbon embroidery, Madeira applique, quilting, painting silks with procion dyes, and beading, These interests started when I was very young and I continue to add additional skills. 7. I adore bookstores and stationary stores! I have a shelf full of blank journals and many journals of various types that I keep: sewing, quilting, cooking, fabric dying, books I have read since 1985, travel journals and now travel sketchbooks to name a few. I write a "welcome letter" to each of my grandchildren when they are born and a detailed letter to each of them on each birthday. I have very few things left by my ancestors and want to make sure that I change that with my family. One of my favorite books is Leaving a Trace by Alexandra Johnson and I’m trying to do so! Addendum: On 5/14 I was also tagged by Casey Toussaint and told her that I would add her name to my entry so she could stop looking for another to tag. Friday is the day that we take care of our Grandson Robbie - who will be 2 the end of July. When the weather is nice, we love to go to the Boat Pond in Central Park. But today it was raining off and on so we chose our back-up location - the Metropolitan Museum of Art. All of our grandchildren love wandering through the big open space that houses the Temple of Dendur. Today he threw at least 50 pennies into the large pools and kept us really moving as he explored. 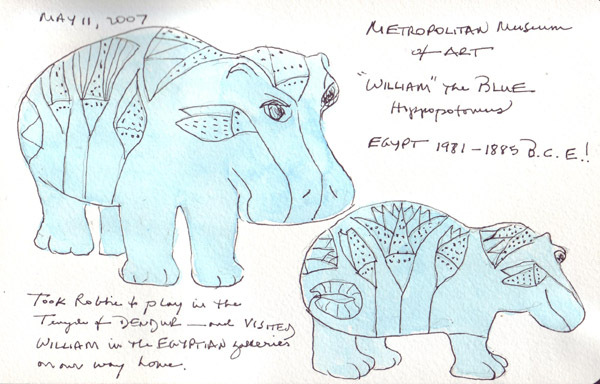 Before we left the museum we went into the Egyptian Galleries to visit William the Blue Hippopotamus, an informal "trademark" for the children's program in the Museum. William is only 8 inches high and approximately 4000 years old! I am currently working my way through 2 art workbooks, one on watercolor skills and one on figure drawing. Both authors are currently exploring "light and shade" in the lessons. For my journal page(s) on May 10th, I moved my basic shapes around and redrew them. Then I put in the hard shadows using watercolor pencils. Finally I looked at the shapes to add the shading and was horrified to notice that I didn't really have a light and dark side that corresponded to the shadows. I have two overhead track lights and two wall lights above my desk in my studio which really confused the lighting. And I decided not to use the strong sidelighting that I used the first time I sketched these shapes because I needed to turn all of the other lights off and then couldn't see my sketch journal well enough to draw. So I added some of the subtle shading that I saw, but it really doesn't correspond well with the true, actual hard shadows. I will rearrange these shapes again one more time and use watercolor paints - not pencils. I sketched a figure from my figure drawing book and then added watercolor to shade the figure. I'm still having problems with proportions This is the rough WC paper that I added to my Michaelangelo Sonnet recycled book (along with several other types) and I hate it. It is hard to use a pen on it and worse than that, it scans really poorly! 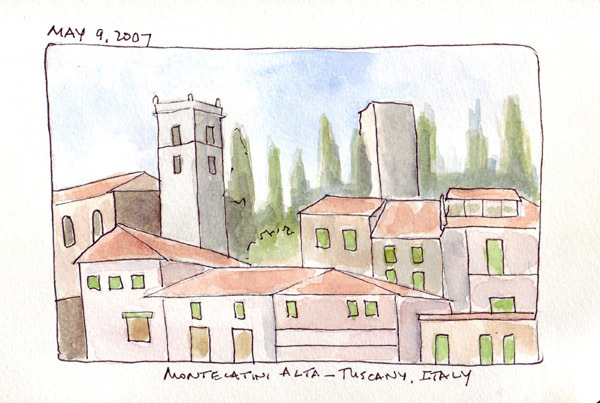 Another long work day - and a quick sketch and painting from one of my photos of Montecatini Alta, Tuscany, Italy. I love rooftop sketches and started to look for photos in my archive that I can use for practice. 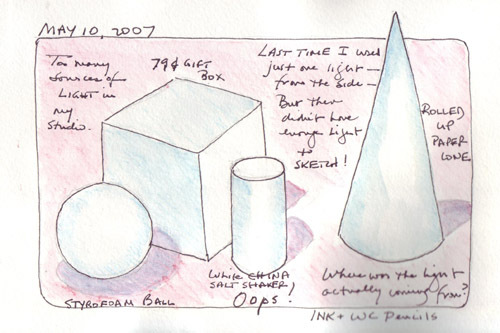 Time to start Lesson 4 in my Watercolor Skills Workbook: 3-Dimensional Form-The Art of Illusion. 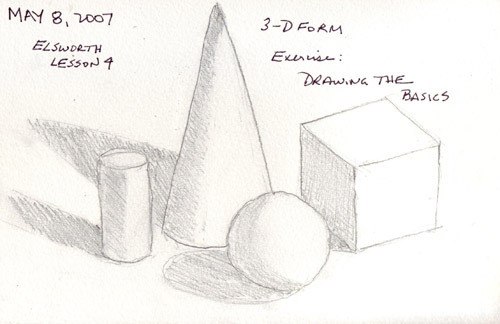 The first exercise is "Drawing the Basics: cylinder, cube, cone, and sphere." I set up the forms, put a light across the still life and sketched the shapes. Next I may try to do them with watercolor shading - but not tonight.